BY SOMEONE OUTSIDE YOUR STATE. In 1998, the Widows Sons were founded in Illinois. When we were founded, I personally, as the founder of the new organization, set up the Official Widows Sons website at http://mastermason.com/widowssons to announce the birth of the new Masonic motorcycle organization, and to promote it internationally. Should anyone outside Illinois desire to start a chapter we had a website for them to contact us. 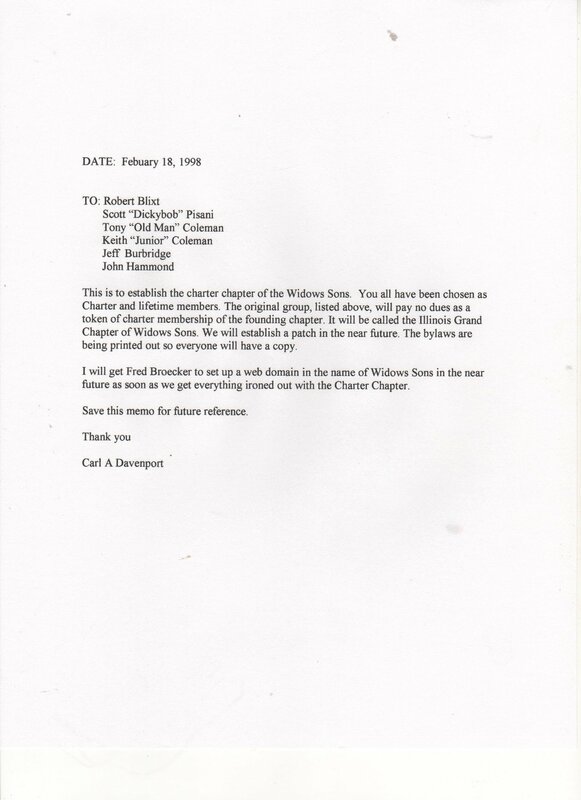 The http://WidowSons.com website was uploaded by me, the founder of the Widows Sons, on Jan 18, 2002. (NOTE: see http://widowssons.ws/ws-memo.jpg for founding minutes mention of the Widows Sons website. http://widowssons.com is the site mentioned in the founding meeting minutes). The first chapter of Widows Sons came through the Official website of the Widows Sons in late 1998 from a brother named Nikos in the Netherlands. Then Michigan, Indiana, and Ohio made contact through the Official Widows Sons website and started chapters, but they unable to remain organized because of pressure form the "old guard" of Freemasonry in their states, and after a few months, collapsed. The Grand Chapter of Connecticut was founded by Chip Stamm by contacting the Official website of the Widows Sons. Then a person named Army Nunez, who became co-founder in 2000, made contact through the Official website of the Widows Sons at http://mastermason.com/widowssons, and Florida became an approved Grand Chapter. Then Texas, and on and on. They all came through the Official Widows Sons websites that were set up to promote the Widows Sons in 1998 and 2002. The Official Widows Sons websites have been the contact point for starting almost every Grand Chapter of Widows Sons. Most likely yours was started through a contact of the Official Widows Son websites. 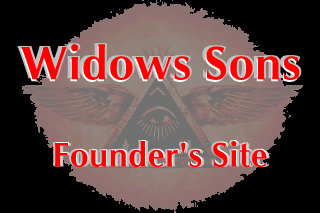 It is called the "Official" because it was founded when the Widows Sons were founded to be the Official website and support the growth of the Widows Sons as it has. 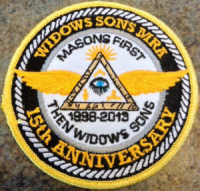 The Official website http://widowssons.com has stood the test of time (15 years of supporting the Widows Sons massive growth) and has been instrumental in the building this great organization, one chapter at a time, since day one. That is why it's Official. It was part of the Widows Son package at the birth of the Widows Son. What can be more official? Do not be fooled by any other website that claims to represent the Widows Sons internationally. If it's web address isn't http://widowssons.com it's not the Official Website of the Widows Sons.